Low cost, inexpensive, downright CHEAP 22 oz. Tumbler Cup w/ a logo. Quality rigid Polypropylene BPA free plastic tumbler with lid and straw. Personalized tumblers by color combinations and your logo printed. Cheap tumblers applications promotional tumblers, special event. Overall size is 5 3/4 H x 3 5/8 dia. Buy in case lots of 250 cups. 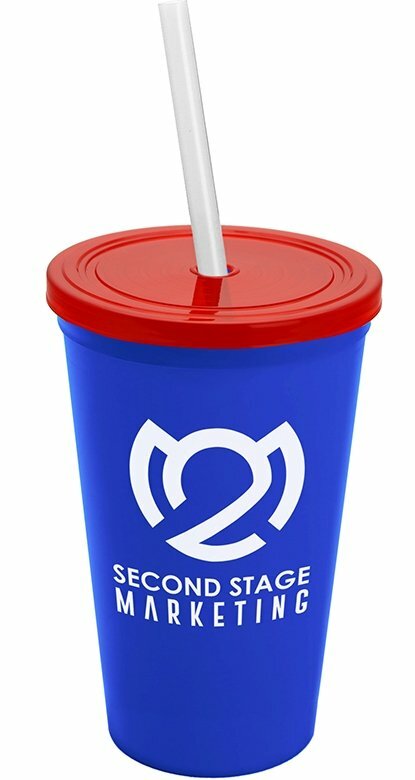 Personalize the tumbler cup, lid and straw color, link is below. This product is proudly Made in the USA, buy USA First. Price includes a one color imprint on two sides 3" w x 3 1/4" h.
one side only, add $55 setup & a run charge $.45 each. and a running charge of $.75 each, min. 500 cups.